When I work under the car and work ... I thought that foreign objects would not get in my eyes, but I'm fine. This review is about item#6739311. Though I thought that it was large and difficult to use, I am satisfied that I can use it smoothly even wearing glasses. I think it is an essential protective gear when using grinders and baby sanders, and this product is cheap enough. We used for ground processing at the time of painting work of floor. 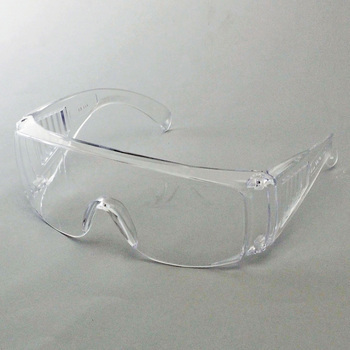 Protective eyeglasses get dirty quickly because they are scratched and paint, so they can be used cheaply and always so that they can be used in clean conditions. It is good to be put on your glasses. And it's cheap. When using a high-speed cutter, sander, etc. I think it is good, because it can be hung from the top of the glasses, it is recommended. This review is about item#20566272. Wearing feeling, holdability, clear sense of vision, both functional well satisfied. I think the price is reasonable. Good at low prices and light. However, they are easily scratched and may be slightly larger and deviate during work. We use for polishing, mowing. It is light and convenient. No matter how much care you take, dust should fly with care because it will fly in unexpected places. This is advice from experience. This review is about item#32582426.